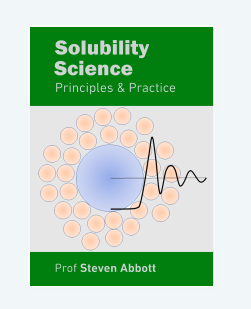 Everything I've learned whilst developing Practical Solubility and formulating in the real world is brought together in my book Solubility Science: Principles and Practice. 193pp & 78k words. It contains lots of good science, with links that take you straight from the book into your default browser to explore the relevant app within Practical Solubility. It is completely free and is not tied to any advertising or email list and doesn't require registration. Kirkwood-Buff theory, the least known and the most insightful theory, especially for more complex solubility issues. Those who prefer alternative solubility theories should read the book to see why I chose not to focus on them. A few rather simple core concepts that take us a long way. Why you really do want to understand Kirkwood-Buff solubility theory! The general-purpose solubility science for practical formulators. The most powerful and fundamental way to calculate solubility phenomena. Useful tools for understanding how to keep dispersions stable. An important area of solubility science properly explained. Facing up to the realities of what goes on in water. If you are going to save the planet with green solubility, then do it properly, not via greenwash. Diffusion and solubility are closely related, so it is important to understand how and why. A lot of our solubility problems come from asking the wrong questions, framed by the language we use. The right language leads to the right questions, and the answers can be found much more easily. The book is Copyright © 2017-8 Prof Steven Abbott and is distributed under the Creative Commons BY-ND, Attribution and No-Derivatives license. You just click to download it and start reading in the format of your choice. By linking to Practical Solubility you get all the benefits of the live apps. On an iPad, for example, a click on a link takes you to see it in Safari and a 4-finger swipe allows you to go back and forth between book and app. On a laptop it's even easier to swap between the two views. PDF. Solubility Science Principles and Practice.pdf. [If you want to download it, use right click.] On a high-res tablet or laptop, PDFs offer a good reading experience and it is the simplest to get going; on a smartphone it may be less pleasant to read. ePub3. Solubility Science Principles and Practice.epub. This works on phones, tablets, PCs, Macs with modern ePub3 readers such as iBooks, Calibre, Azardi, IceCream etc. How do you get it into, say, iBooks? I use Dropbox on my iPad and choose iBooks to run it. You may find other ways via, say, email. Kindle mobi. Solubility Science Principles and Practice.mobi. Mobi is generally agreed to be a deeply unsatisfactory format and it is frustratingly hard to get the format right, but Amazon continues to use it so we all have to produce it as best we can. This version seems to work OK but don't blame me if there are glitches. How do you get it into your Kindle reader? On my PC I simply put the file into the My Kindle Content folder and run Kindle for PC (it won't work on the Windows App version) where it automatically appears in my available books. I don't have a stand-alone Kindle reader so I don't know how to get it on to one of those, but I believe it is not too hard. For simplicity/reliability, footnotes are at the end of the relevant paragraph. My task has been to find the good, useful scientific principles and distill them into words and apps that allow people like me to use the principles in practice. In addition to reading books and many 100's of academic papers, I've had the chance to meet and learn from some of the great modern solubility scientists and many that I haven't met have most generously helped me via email. All through the book, and in any app where I needed help with the algorithm, I acknowledge their generous inputs. All the credit for the science goes to them. All the blame for errors in describing and implementing their science goes to me.